"Time," Albert Einstein once said, "Is what clocks measure." But how do clocks measure time? And how did clocks come to be invented? The days and nights are one profound measure of our time. And so, one explanation is that sitting under the stars on the surface of the planet Earth, we are actually living inside a clock. At night a glance at the stars above seems to show them fixed and motionless, some bright, some dim. Longer examination shows the brightest stars apparently collected in constellations, or groups of stars. And they are given names like Orion and Draco and Ursa Minor. Longer study of the stars at night reveals that the stars are actually moving very slowly, and for the most part tracking westward. But not all move westward. Some of them move eastward. And in the northern hemisphere, one star hardly moves at all. It is called Polaris, the pole star, and all the other stars in the sky slowly revolve around it. Polaris is a star in the constellation of Ursa Minor (the Little Bear), and the other stars in the constellation curve away from it in arc to a rectangle of four stars at the end. And as the night passes, the whole constellation of Ursa Minor rotates anticlockwise around Polaris. And while they are visible at night, they are still there during the day, masked by the blue sky of daytime. The north and south celestial poles mark the axis around which the Earth revolves, and gives rise to the apparent motion of both the stars and the sun. This axis is inclined at about 23 degrees to the ecliptic - the plane in which the Earth orbits around the sun. The pole star, Polaris, appears overhead at the north pole at 90 degrees of latitude north, and on the horizon at the equator at 0 degrees of latitude. And so at any northern latitude, a gnomon pointing north with an angle of elevation equal to the latitude will aim directly at the pole star. And with a circular clock face set with the gnomon passing through its centre, the stars would appear to rotate in perfect circles around the perimeter of this clock face, seen from some point on the gnomon. The arm of Ursa Minor might be seen as the hour hand of a 24 sidereal (star) hour 'star clock'. And if 24 hours are marked out in a circle on a the gnomon's clock face, and the inner circle cut out, the 'hour hand' of Ursa Major would mark the hours as it turned. Navigators like Columbus used a slight variant of this star clock - a 'nocturnal' - to measure time at night. And if time is often thought of as cyclical rather than linear, it is at least in part because the stars rotate in circles in the sky, and the Earth circles the sun. Sidereal time is time as measured by the stars, using a star clock, and isn't the same as solar time measured by the the apparent motion of the sun. A sidereal day is the time it takes for a star to return to its original position in the sky. It takes 366.2422 sidereal days for the Earth to complete a single orbit around the sun. But, during that time, there are only 365.2422 solar days, because the solar day is slightly longer than the sidereal day, and one day gets 'lost' in one orbit around the sun. So one sidereal day is the fraction of a solar day equal to one solar year divided by one sidereal year, or 23 hours 56 minutes and 4 seconds. If we use solar time, it is to synchronize our clocks with the bright sun rather than the dim stars. If the sun was a dim star, and some star was as bright as the sun, we would use sidereal clocks. If the Earth revolved around the sun in a perfect circle, each solar hour would be of equal duration. But since the orbit of the Earth is elliptical, with the sun at one focus of the ellipse, and the Earth moves through equal angular areas in equal times (Kepler's 2nd law), it follows that unequal angles are moved through in equal time, and the length of a solar day varies throughout the solar year. The result is that instead of measuring sidereal star time, or solar clock time, modern clocks measure the 'mean' solar time of an imaginary sun at the centre of an imaginary circle. Greenwich 'Mean' Time (GMT) is an imaginary time. The clock dial at the top of the gnomon used to construct a star clock may also be used to mark the hours in a solar day, as the sun circles the clock dial. The shadow that the gnomon casts on the dial shows the time. And if the shadow that the gnomon casts onto a horizontal or vertical surface is marked at each hour, they form a sundial. 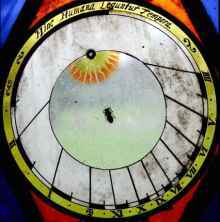 To the right is a stained glass sundial (circa 1600 AD), whose gnomon protrudes from the sun symbol to cast a shadow upon it. However star clocks and sundials can only be used with relatively cloudless skies. When skies are overcast for prolonged periods, other kinds of clocks are needed. Among the simplest of clocks are candles which indicate the passage of time on markers along their length. Sand clocks - hourglasses - can be used to measure time, as sand flows from one container to another. Simple water clocks can measure time by the filling or emptying of a receptacle with water. The construction of a mechanical sidereal water clock entails replicating the Ursa Minor star clock as accurately as possible. One of the earliest kinds of clocks were water clocks, or clepsydras ('water thieves'). In one form, a constant head of water provides a steady flow of water into a tank. As the water rises, it raises a float and a toothed rack, which turns a pinion on whose shaft an hour hand projects. Once the tank has filled up, the water has to be released from it, to empty it and start all over again. In this replica of such a clepsydra, the hour hand is shaped like Ursa Minor, with Gamma Ursa Minor - the star Pherkad (Arabic = "calf"), one of the polar 'guard' stars - as the pointer. To test the accuracy of the clock, it is compared with the Ursa Minor 'star clock', and the flow of water is reduced if it runs too fast, or increased if it runs too slow. And perhaps from the clepsydra we take the idea of the 'flow' of time like the flow of water. But there are some fairly obvious problems with such a clock. It may be difficult to control the flow of water. And since water evaporates, the tank of water will steadily lose water by evaporation, depending on air temperature, pressure, and humidity. Also, impurities in the water may lead to build-ups of deposits, gradually changing the rate of water flow, and also tank volume. And all the components in this clock are likely to expand and contract with temperature. And friction between rack and pinion will act to push the float lower in the water. And, of course, if temperature falls too low, the water will freeze, and the clock will seize up. And a clepsydra isn't a portable clock, because it can't be tilted. And it relies on a supply of water - although a clepsydra might be made into a closed system, with water being steadily pumped back up from the bottom to the top. One variant of a clepsydra might be a tidal clock, in areas where there are significant ocean tidal rises and falls. A tidal day is 24 hours and 50 minutes, during which there are two high tides and two low tides. Rising and falling tides might be used to raise the float of a clepsydra to turn a clock hand. However, since tides rise and fall to different heights, such a clock would have to be recalibrated very day to count the hours between high and low tide. Furthermore, the rate at which the tides rise and fall are not constant. But if tidal movements may not be regular enough to measure hours, they can be used to approximately measure 6 hour periods, and the Moon's phases - full, half, new - occur at approximately seven day intervals. Bored during Mass at the drafty cathedral in Pisa, the seventeen-year-old Galileo noticed that the chandelier overhead took as many beats to complete an arc when hardly moving as when it was swinging widely. In a variant mechanical clock, the water power source is replaced with a weight or a spring, and the clock is regulated by an escapement mechanism of some kind. A pendulum with its own swing period offers a form of regulation. In the example shown, a swinging pendulum stops and then releases a weight-driven pinwheel. The pinwheel provides a kick to the pendulum each time it is released, so that the pendulum keeps swinging. Such pendulum clocks are likely to be more accurate than clepsydras, because there is no water to evaporate or condense, and the force exerted by a weight will be constant. But once again they are not portable. It was only in the 18th century that spring-powered portable chronometers with flywheel escapements became available, mostly in order to determine the longitude of ships (by comparing the local apparent time with Greenwich Mean Time shown on an accurate chronometer). And these chronometers were checked against the stars for their accuracy. 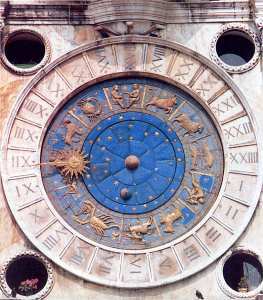 The famous clock in Venice's St Mark's square has a pinwheel escapement, and is also a 24 hour clock, but with a clockwise or solar motion - its solar hand indicating that it is a solar clock. In the northern hemisphere, the apparent motion of the sun in the southern sky is clockwise from east to west. It also shows the astrological signs (or constellations) of the 12 'months' in a year. In modern quartz crystal clocks the crystals resonate at a high frequency, and generate an electric signal that operates an electronic clock display. And the accuracy of modern atomic clocks is such, it seems, that instead of the rotation of the Earth remaining the fundamental measure of time, it is these atomic clocks which are the current true measure of time. The Earth, in conserving its angular momentum, speeds up like a spinning ballet dancer when it contracts (as in the 26 December 2004 tsunami disaster). If so, then digging minerals from inside the Earth to build skyscraper buildings serves slowly to expand the Earth, and slow the Earth's rotation. Almost all these mechanical clocks demonstrate some kind of periodicity. The stars and the sun circle daily in the sky. Pendulums swing, and crystals oscillate, in equal time. And yet human beings also have a sense of time. Human life has its own periodicity. Human life is rhythmic in very many ways. Hearts beat. Lungs breathe. Legs swing as they walk. Even speech and song has its rhythms. In the absence of sun and stars and clocks, the human sense of time is all that is left. Something as simple as a dangling leg has its own natural swing period, and to make it go faster or slower requires extra work to be done, either in speeding it up, or slowing it down. If people have a natural walking speed, it is probably defined by the natural swing period of legs. When Galileo counted the beats in the period of the swinging chandelier in Pisa cathedral, he used the pulse of his own heartbeat as his measure of time. To measure time this way, each heartbeat or breath may be counted on a circle of beads, with some marker indicating a complete circuit of the circle. But heartbeat and breathing speed up when we become busy or excited. And so if the pulse of the heart, or the inhalation of the breath, are to be used as a measure of time, whoever counts them must be comfortably seated, maintaining a single static position, contemplating one single thing, and not allowing thoughts to stray to ideas which might arouse excitement of any kind, and thus alter the steady tempo of breath or pulse. To be seated meditating in the Buddhist lotus position perhaps fulfils these conditions - as perhaps did Galileo, leaning bored against the cathedral wall in Pisa. It may be that, before clocks were invented, people were able to record time very accurately using their in-built biological clocks and sense of rhythm. If drummers can maintain a steady beat, so also perhaps mantras can be regularly chanted or intoned, and used to count time on beads or wheels. Such beads and wheels were perhaps the first clocks. The recitation of repetitive prayers, counted on beads, was perhaps as much a means of timekeeping as a devotional practice. The Catholic rosary has 5 sets of 10 beads (the Aves), and 4 intervening beads (the Paters) in a circle, with an extra 5 beads suspended from this circle, and a terminal crucifix. Thus the number of beads is 59, and with the cross (a letter T) the grand total is 60. Which is - perhaps entirely accidentally - the number of seconds in a minute, and the number of minutes in the hour. The rosary, seen in this manner, is a clock. And somebody at prayer, counting the seconds with one had on a rosary, and counting the minutes on the other on another rosary, would become a clock with a minute hand and a second hand - which could be consulted much as any other clock or watch. Furthermore, the recitation or chanting of mantras or prayers in concert with others may have served to help maintain a steady beat or rhythm, day and night, with those going too fast required to slow down, and those going too slow required to speed up, and those growing tired being replaced by others - and with some counter totalling up the numbers of prayers or mantras chanted to give a measure of passing time, whose accuracy could be checked against the sun or stars. All these practices - of meditation, of drumming, of chanting, of candles, of counting repetive mantras on beads or wheels - are usually associated with religious practices. As also are the divisions of the year. And therefore it may be that such religious practices were in some part concerned with the measurement of time in centuries, years, months, weeks, and days. But perhaps also in hours, minutes, and seconds. It may be that Buddhist or Christian monks, chanting in monasteries, were perhaps able to keep very accurate time, and could each perform all the roles of modern clocks. And perhaps it was once one of the primary tasks of any priesthood to mark and measure the passage of time, a task now superseded by mechanical and quartz clocks.